This week's story recommendation is "Sinner, Baker, Fabulist, Priest; Red Mask, Black Mask, Gentleman, Beast" by Eugie Foster, a novelette from the January/February 2009 issue of Interzone, reprinted here in the August 2009 issue of Apex Magazine. This is Foster's second SROTW, joining Paolo Bacigalupi, Catherynne M. Valente, Aliette de Bodard, and Leah Bobet as two-time recommendees. Perhaps even more significantly, "Sinner, Baker, Fabulist, Priest; Red Mask, Black Mask, Gentleman, Beast" was nominated last week for the Nebula Award. "Sinner, Baker, Fabulist, Priest; Red Mask, Black Mask, Gentleman, Beast" is set in a world whose residents don a different mask each morning, abandoning their individual personalities (a concept utterly foreign to them) in favor of the role represented by that day's mask. Perhaps inevitably, our viewpoint character(s) encounters a person who challenges this way of life. A story with a premise like this can easily be swallowed by its own metaphors, but Foster manages to keep the tale moving forward, using elegant but not flashy prose. This is a fascinating, absorbing story, even if I have mixed feelings about the resolution, and I will certainly be including it in my Hugo Award ballot. Walter M. Miller, Jr. - Crucifixus Etiam (1953) Most of my favorites from the Golden Age are on the usual suspects list, "Flowers for Algernon," "The Star," etc., but "Crucifixus Etiam" has been largely forgotten. In a way, that's appropriate; the story is about brave pioneers whose heroic efforts will surely be forgotten by the later generations who benefit from them. Orson Scott Card - Holy (1980) Card is known for Ender's Game and sequels, but much of his best work is in his early short fiction. Some of his best short stories were well received at the time, such as "Unaccompanied Sonata" and "Lost Boys," but "Holy," from Robert Silverberg's New Dimensions series of anthologies, was almost entirely ignored. Card must have written it on a dare -- the story is about a man trying to get to a particular rock to smear human feces on it, and by the end Card actually has you caring about whether that happens. Connie Willis - Chance (1986) For all the awards Connie Willis has won, "Chance" somehow slipped through the cracks, but it's one of her very best, emotionally powerful albeit not as funny as, say, "Even the Queen." Greg Egan - The Moral Virologist (1990) Originally published in Pulphouse: The Hardback Magazine, this is a great thought experiment story. What if you tailored a virus to kill people who commit adultery? Susan Palwick - Sorrel's Heart (2007) This is one of my favorites of this century, from Palwick's collection The Fate of Mice. It didn't get the attention it deserved, although Jonathan Strahan picked it up for his year's best anthology. Labels: Connie Willis, Greg Egan, Orson Scott Card, Susan Palwick, Walter M. Miller Jr. 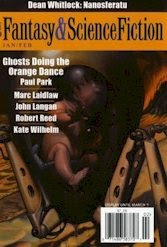 This week's story recommendation is "Ghosts Doing the Orange Dance" by Paul Park, a novella from the January/February issue of F&SF. It occurs to me that every memoirist and every historian should begin by reminding their readers that the mere act of writing something down, of organizing something in a line of words, involves a clear betrayal of the truth. Without alternatives we resort to telling stories, coherent narratives involving chains of circumstances, causes and effects, climactic moments, introductions and denouements. We can't help it. But perhaps we can help it, for Park proceeds to do none of these things. "Ghosts Doing the Orange Dance" is not a coherent narrative, nor does it ever accede to the notion of cause and effect. "Did you think I'd be jazzed about this?" he complained, indicating the phrase "whispered drunkenly" in the text. "Did you think I'd want them to think I'm an alcoholic? Though in a way it's the least of my problems: Right now they are reading this," he whispered drunkenly, conspiratorially, "and they have no idea why. Right here, right here, this is confusing them," he said, pressing his pudgy thumb onto the manuscript a couple lines later, a fractured and contradictory passage. Park tells us he advises his writing students "to consider the virtues of the simple story, simply told," but if you are looking for such a story, stay away from "Ghosts Doing the Orange Dance." If, however, you are open to a tale rather less linear and more offbeat, replete with phildickian reality shifts and self-deprecating humor, you should greatly enjoy this. Eventually, the disparate elements of the story do circumscribe a plot, although for most of the narrative one can't be sure if it is a tale about ghosts or alien visitations or a jewel heist or merely the prevalence of schizophrenia in the Park family tree. All we are certain of is this fellow Paul Park is an extremely unreliable narrator. Kudos to the author for creating such a fun character. This week's story recommendation is a somber occasion. My recommendation is "The Bohemian Astrobleme" by Kage Baker, who passed away this week at the age of only 57. 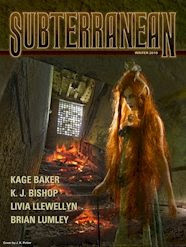 "The Bohemian Astrobleme" is a delightful steampunk novelette from the Winter 2010 issue of Subterranean Online, the quarterly e-zine from excellent small publisher Subterranean Press, which routinely prints short fiction from some of the top names in the genre. Kage Baker is best known for her "Company" time travel stories, but she has written in many styles. "The Bohemian Astrobleme" is lighthearted steampunk, set in the same universe as her recent novella The Women of Nell Gwynne's (which obliquely ties into the Company sequence), with an appearance by the heroine of that tale, the intelligent and admirable prostitute Lady Beatrice. In "The Bohemian Astrobleme," the Gentlemen's Speculative Society discovers a material with strange and useful properties, possibly of extraterrestrial origin. Two of its members, along with a less-than-trusty assistant, set off from England to find more of the material, making use of a remarkable array of equipment most of us did not realize was available in the Victorian era. They proceed into Eastern Europe for the hunt, which ends up turning on an amusing but convincing point of chemistry. "The Bohemian Astrobleme" makes for highly entertaining reading, and what a shame it is we cannot look forward to much more of the same from Baker in the future. Incidentally, I do not intend to turn the Story Recommendation of the Week into an obituary column (the "obit" effect contributed to the current hiatus of the Book of the Week, which became depressing), but by coincidence I came across "The Bohemian Astrobleme" just before Baker's death, and what better way to honor the memory of a departed author than by enjoying her work?